This is what I did last night as I was waiting patiently for my son to come home from college. I saw the colors that Lesley chose over at the Merry Monday Challenge and I knew I wanted to play along again. I don’t usually make many Christmas Cards, because for the past 26 years that has been my husband’s job. was making his own Christmas cards, and that tradition has continued. We give out about 175+ cards each year. That number is not a joke…I promise! After Christmas I will make a post of a couple of my favorites! Anyhoo, so this many Christmas cards is unusual for me, but I am really enjoying it! I used Swiss Dots and Victoria Cuttlebug Embossing folders. The snowflake punch is MS.
Not overly happy with my ribbon, but wanted to tie in the brown from my pearls. The very cool ornament shape is an Ellison Die from my school. Love it! I am sure your tired of my Merry Christmas sentiment form Gina K…but it works well every time! I am so Thankful for each and everyone of you, you make me smile each and every day! Categories: Cards | Tags: Card making, Cards, Christmas cards, cuttlebug, embossing, Merry Christmas, ornaments, rubber stamps, stamping | Permalink. This is gorgeous…..so elegant. I love the little snowflakes you added…..a perfect touch! Beautiful and elegant. Love the white on white look! Gorgeous card Nancy. 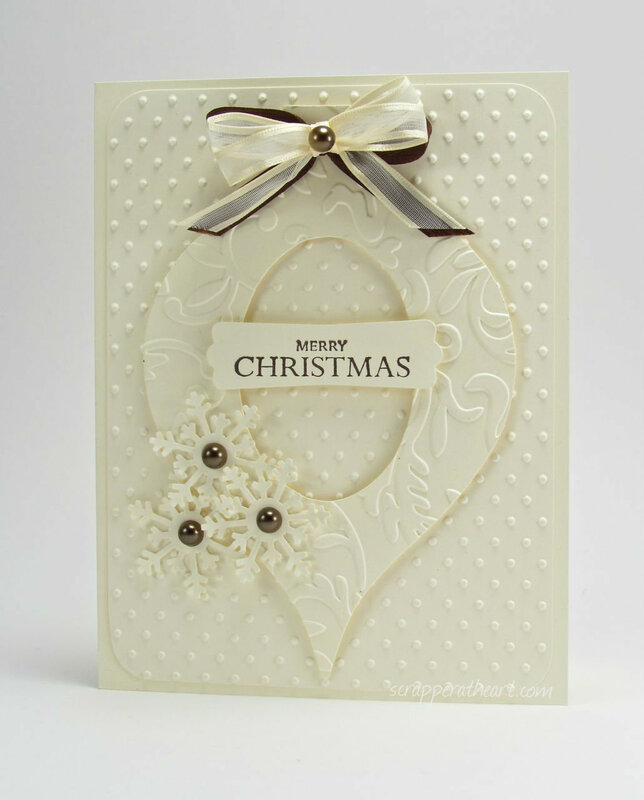 Love your embossed ornament with the oval cut-out. Thanks for joining us at Merry Monday. This is gorgeous Nancy. Love the cream on cream with the touch of brown and the snowflakes are a perfect touch. So glad you are getting to craft while you are off this week. Have a wonderful Thanksgiving. 175 Christmas cards? You’re lucky he does them. Yours is beautiful but I can’t imagine making that many of them. Yeah …we use to color them all…I finally convinced him to go to a print shop. It’s costly but worth it. The only reason why we give out so many, is because we work in the school system and when we switch schools everyone always says…”I will still get a Leppek original Christmas card won’t I.” so hence 175+. Thanks for commenting! Oh, my, Nance, this is GORGEOUS! Love that big ornament and all the embossing and the ribbon treatment! Thanks so much for sharing it with us at Merry Monday! Hope your son got home afely and you have a wonderful Thanksgiving! Beautiful card, Nancy, so glad you decided to make this one! Everything about it is stunning! YOWZA!!! That is gorgeous! Beautiful texture, lovely ornament. Happy Thanksgiving! Lovely card Nancy, I love all that texture. Thank you for joining us for Merry Monday. Beautiful take on the challenge…I think your ornament is just lovely! Thanks for playing with the Merry Monday challenge this week! I love that large ornament die cut. Beautiful card. Gorgeous! Love the elegant design! Nancy your card is stunning! Every detail is perfect. Thank you so much for joining us at Merry Monday. What a stunning card, Nancy. I love it and the embossing. It is so pretty! Can’t wait to see the cards your hubby makes. Thank you for joining us at Merry Monday! Wow, this is just stunning! I love the ornament die cut you used. It reminds me of the old German ornaments I used to see on my grandparents tree when I was younger. The pearls are gorgeous and I love how you tied everything in together. Thanks Christy….that is exactly what they reminded me off too. That is what we had all over our tree when I was little. Happy Holiday to you! Beautiful card, Nancy. Love all the texture you’ve created with dry-embossing. Thanks so much for joining us at Merry Monday. Beautiful card Nancy! Love what you’ve done with the ribbon. Perfect for the challenge! Congratulations, Nancy! 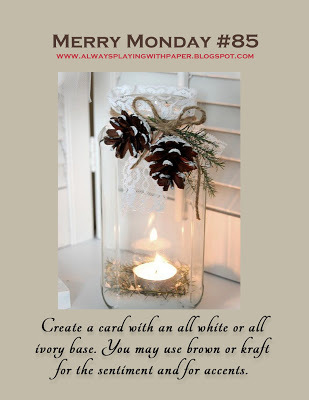 Your beautiful card was chosen as the winner at Merry Monday! If you would like to be our Guest Designer next week, email me and let me know. Congratulations on your win at Merry Monday, Nancy. It truly is a fantasticly beautiful card. Thanks sooooo much Bobby…I love when you stop by! HUGS! So ELEGANT! LOVE the ornament and the monochromatic colors!